Dish blamed Fox for introducing other channels into negotiations despite those not being included in the contract up for renewal. While it may seem like a win for our side with millions not being subject to right wing propaganda, it is worth noting that Dish decided to offer an alternative right now, which is The Blaze, the conservative channeled owned by Glenn Beck. I’m not really sure which one is worse. Both channels are nothing more than propaganda. But is that what Dish wants, to push right wing propaganda? Something interesting about Dish Network. If you go with their entry level package, called the “Smart Pack“, you only get one cable news network. That just so happens to be Fox, at least until this riff happened. That is their $34.99/month package, which is on sale right now for $19.99/month. If you want alternatives in cable news, like CNN or MSNBC, well then you need to upgrade to the next tier, “America’s top 120”. For $54.99/month (currently on sale for $29.99/month) you can then choose between Fox, CNN and MSNBC. Now you may be thinking “well that sounds common”, but compare it to DirecTV, the country’s other satellite provider. Their entry package, called “Select”, gives you all 3 cable news networks. It’s also on sale right now for $19.99/month and regularly $32.99/month. Not only does it provide better options, for less money, but Dish Network’s entry package has 55 channels, while DirecTV’s has over 120 channels. When you look at this and compare the packages, economically DirecTV makes much more sense. So that makes me wonder why Dish Network offers so much less, for more money? Not only that, but how can DirecTV offer all 3 cable news networks for a lower price than Dish Network with only Fox News. 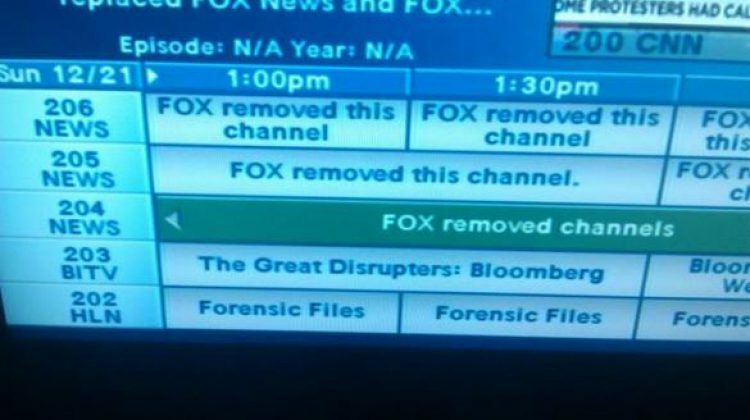 If Dish Network was truly fed up with Fox, then wouldn’t they just drop them from their entry level package and replace it with CNN or MSNBC? That seems to be the logical thing to do, unless there’s a reason why Dish Network wants to keep pushing America’s right-wing propaganda network. I would love to hear the rationale for this from some of the decision makers at Dish.